Dr. Mike Ladle is not only a world renowned marine biologist but one of the saltwater spin fishing pioneers in the UK. Over the years he has written multiple books on spin fishing as well as regular columns in several fishing magazines. Mike has kindly agreed to let AANZ publish a few vignettes from his book “Operation Sea Angler”. Even though the species of fish caught and location is different the thought processes are the same. In order to be successful as an angler it is important to understand the target species, especially the how, where, when and why it feeds. “In short, what are the right places and the right times? If we knew all the answers we would be out fishing instead of writing a book; at this moment, on some beach, the conditions are perfect for making a good catch. There are so many possible permutations of place, time, tide and weather that for an angler to find the correct combination every time would make solving Rubik’s Cube seem like light entertainment for chimpanzees. However, by a reasonably systematic approach, by noting recurrent patterns of events and, above all, by many hours of observing and fishing, it has been possible to develop methods in which we, at least, have confidence. Of course we don’t catch good fish every time we go fishing, but then – who does? Subject to the vagaries of the climate of the British Isles the seasons of the year come around with pleasing regularity. 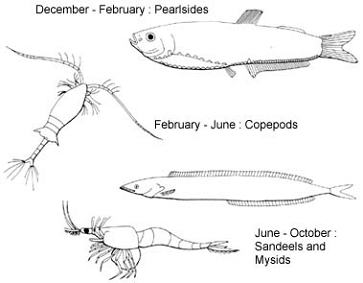 Associated with these seasons are the annual breeding and feeding migrations of various species of sea fish. Among the best known of these is the spring dispersion of huge shoals of mackerel from the Continental shelf off south-west England and from the regions offshore of southern Norway. In November and December the fish are massed on the sea bed and feed little, taking only small numbers of crustaceans, worms and small fish. From December to February the mackerel move in towards the coast and, during this period, migrate towards the surface of the sea during the hours of darkness, gradually forming surface shoals. In this phase of their migration the mackerel eat small fish such as the tiny silver pearlside, only an inch or two in length and having a belly lined with pale-blue luminous dots. In late winter and spring the fish move into their spawning areas before spreading out around our coast. During this shoaling phase mackerel feed mainly on copepods, little drifting crustaceans about the size of rice grains. Good commercial catches of mackerel are often taken in what fishermen term yellow water, rich in copepods. Poor catches are associated with greyish water having an unpleasant smell. In the June to October period (when most of us catch them) the fish range along the coastline and their diet changes to small fish such as sand eels, together with some shrimps and prawns. Later, they return to the overwintering areas offshore. Along the coast of Cornwall, winter mackerel are caught on trolled feathers. A second example of seasonal migration is seen in the cod which, in British waters, spawns in late winter and spring when water temperatures are about 4-6°C, one of the main spawning areas being in the eastern section of the English Channel. After spawning, the shoals of cod disperse into the feeding areas. Congregation for spawning seems to be the only systematic seasonal movement of these fish. Examples such as these could be continued indefinitely, but knowledge of migrations is only of value to most anglers if the movements result in the fish coming comparatively close inshore. For much of the time large concentrations of spawning fish, whether they be mackerel, cod or other species, are far beyond the reach of beach or small-boat anglers. In a few cases, such as that of the black bream, an understanding of the spawning migration and habits is essential to consistent angling success. In other cases the information is only of academic interest. Superimposed on the seasonal spawning and feeding migrations are the activity patterns of each species. 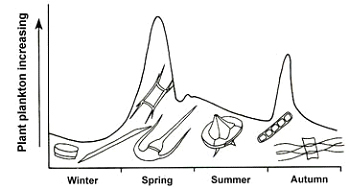 For example, the response of fish to water temperatures. Those fishes that are near the northern limits of their distribution, such as conger and bass, tend to be more active in the warm months of the year. In contrast, cod and haddock are caught chiefly in winter and are chiefly distributed to the north of Britain. The main geographical area occupied by the cod lies between the water temperatures of 0°C and 10°C and the annual mean isotherm for 10°C almost cuts the British Isles in two. Within the area which we fish, the sea temperature at Swanage reaches its minimum of about 7°C in February and for most of the year is well above 10°C. 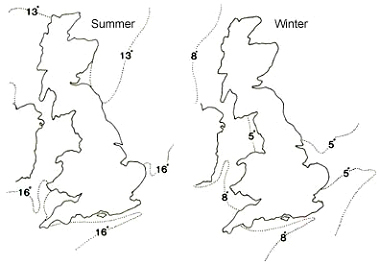 (Presumably the effect of global warming will be to shift these zones northwards and the fish will go with them). Most fish feed actively when the water temperature is well within the range of the area in which they normally live, i.e. neither too warm nor too cold. Apart from the direct effects of water temperature, day-length etc. on the fish themselves, there are also the indirect influences of these factors on the fish’s food supply. In the normal year the spring months and lengthening days herald the development of a massive growth of microscopic drifting algae, itself stimulating an outburst of small planktonic (drifting) animals. This zooplankton is soon supplemented by the numerous drifting larvae of bottom-living worms, crabs and clams and also the innumerable fry and young stages of the fish themselves. All these tiny, vulnerable creatures provide food for larger fish. On a daily basis, the twenty -four hour cycle of daylight and darkness is the trigger for the rhythmic activity of many small animals. The best known of these patterns is the vertical migration of the plankton. This involves the active upward swimming of crustaceans and other forms at the approach of darkness, followed by the reverse movement in daytime. Although the creatures which make these migrations are small, the depths which they cover are surprisingly great, commonly ranging from as much as twenty fathoms (say 40 metres) deep at noon, up to the surface at dusk and returning again to the same depth just before dawn. Obviously it is an advantage to fish such as mackerel, horse mackerel. garfish or herring, which feed on these creatures, to make similar migrations to those of their prey. This is precisely what they do. Herrings form shoals on the seabed in daylight hours and swim almost at the surface of the sea at night. However, when the water is turbid due to storm disturbance or dense plankton growth the fish will also spend the hours of daylight nearer the surface. Larger predatory fish also swim towards the surface at night to feed on mackerel, horse mackerel and the like. Hake, for example, are near the seabed in deep water during the daytime but feed almost exclusively in mid-water in the hours of darkness. 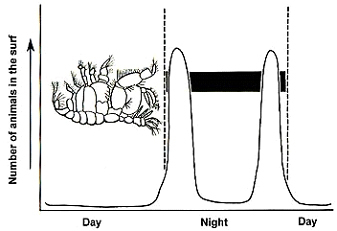 Of more obvious importance to the shore angler is the curious behaviour of the night-tidal plankton. Every sandy beach is inhabited by a great variety of clams, worms and beach hoppers which, at all states of the tide, spend the daylight hours well hidden in their burrows. They are normally only to be seen by washing a shovel full of sand through a fine sieve. At night the beach hoppers, in particular, emerge from their hiding places to swim actively in the surf. At this time they become available to foraging pouting, school bass and dabs. One of the main reasons for this behaviour is the dispersal of male beach hoppers in their search for mates. In consequence there is a much higher proportion of males in the surf than burrowing in the beach. The number of these animals in the surf is greatest in July and there are other peaks in April and September. Most are swimming just after dusk and before dawn. Rough conditions also cause an increase in the amounts of activity, but most still occur after dark. 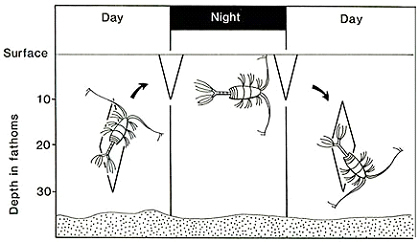 A daily cycle of activity is also shown by the common brown shrimp which lives on sandy beaches. Normally, when the tide is out, these shrimps burrow in the sand below the low water mark. As the tide rises the shrimps leave the sand and disperse by swimming in the water. Bright light partly prevents swimming behaviour so that most activity occurs on flood tides in the hours of darkness or, notably, when rough seas colour the water. 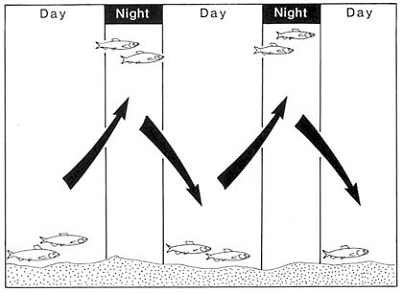 All this nocturnal activity, often centred on two periods round about dusk and just before dawn, is closely associated with the feeding habits of small fish such as pouting, rocklings, poor cod, gobies and sole. In our area pouting and poor cod are often so numerous that fishing for other species after dark, with small baits, is scarcely worthwhile but remember – where there are little fish there will usually be predators. These are just a few examples of what is behind the success of angling at particular times of the day or year. Additional cases related to commonly used baits will be given in the following chapters. Too many variations occur for all the possibilities to be dealt with but the angler should be able to work out the best approach for the fish of his or her choice. A peculiar phenomenon, rather different to the above, is the so-called selective tidal stream transport behaviour of fish. This occurs in some species which are of interest to the angler. Inquiries among Dutch commercial fishermen revealed that in spring, prior to spawning, the common sole swims up to the surface of the sea. This takes place at night when the tidal currents are flowing towards the coast. When they reach the surface, the fish lie immobile and adopt a posture which presents a large surface area to the water currents. In this way they are able to drift, with a minimum of effort, from deep water feeding grounds towards inshore spawning areas. There is some evidence that the fish may navigate by the stars. A similar form of behaviour has been noted in the plaice and it would seem likely that other fishes use the same means of transport. While night fishing from a small rowing dinghy on calm nights in late summer, the authors have observed, in the light of a torch, small groups of three or four garfish drifting passively with the ebb current, a foot or two below the water surface. Possibly this is an example of a similar energy conservation measure. In any event it is a tiny but fascinating piece of the piscatorial jigsaw puzzle”. Many of the things mentioned by Mike probably have parallels elsewhere. So in order to be successful it is important to try and find out more about your local marine ecosystem and slowly piece together the jigsaw. Next Next post: WHICH MONTHS ARE BEST TO FISH THE TONGARIRO?